Blue and yellow make green. Yin and Yang make life. 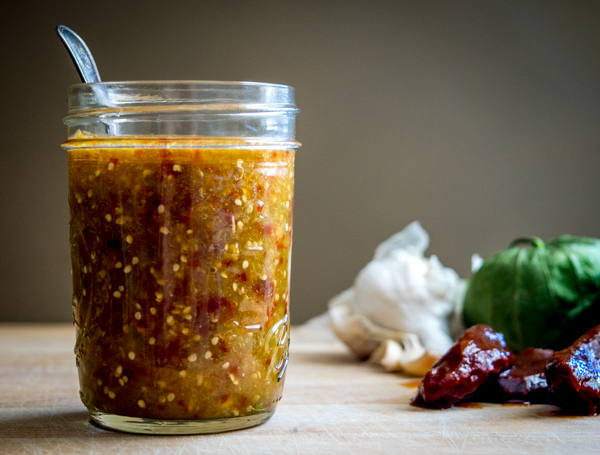 It’s difficult to peg how so much goodness can come from so little in this Tomatillo Chipotle Salsa, but instead of trying to figure out how it happens we are better off just eating it. This salsa is so unique that no one will believe you when you show them the minuscule ingredient list. Maybe it’s best not to tell them. Note that we are omitting the onion here and the result is more of a topper sauce; slightly more concentrated than our standard sauces. So while I am normally a fan of drenching dishes in sauce, starting off with a more restrained portion of this Tomatillo Chipotle Salsa will serve you well. Start by husking and rinsing four tomatillos. Roasting the tomatillos will tame the tartness so we’ll put them in the oven at 400F. In about 10-15 minutes they’ll turn army green in color, this means they’re done. 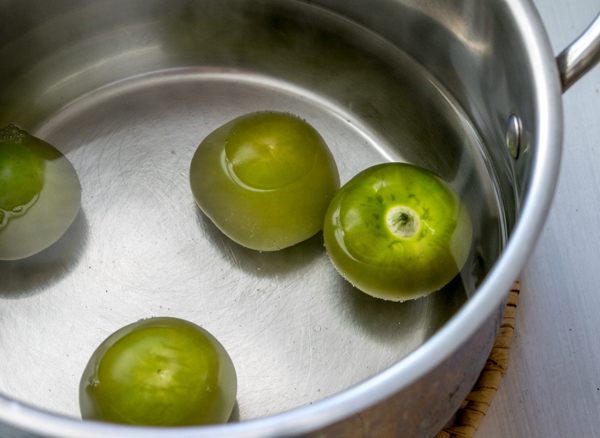 Note that there are many ways to “roast” the tomatillos. You can boil them and get a similar result. You can also line a skillet with foil and “roast” them on the stovetop. Any of these methods will work as it is the heat that is the most important component. 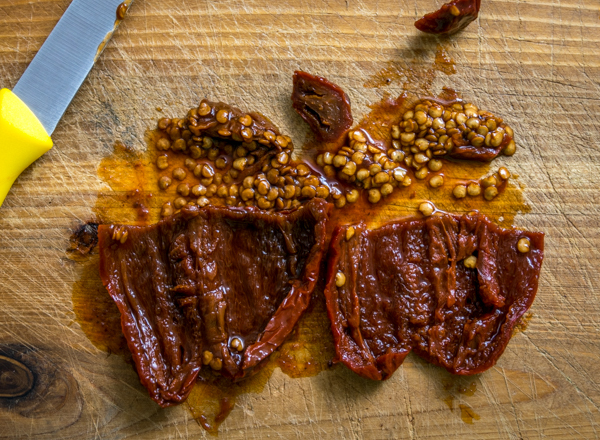 Rick Bayless has a version of this salsa that also roasts the garlic. 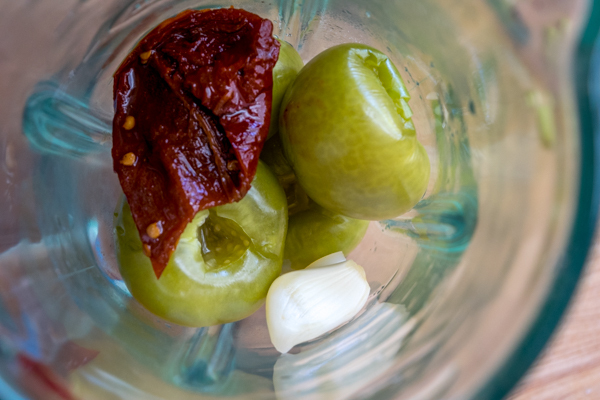 This will still give you a great salsa, but lately I prefer the sharpness of the unroasted garlic we are using in this recipe. If you want a milder hit from the garlic you can consider roasting it. I usually de-seed the chipotles, but don’t worry if you leave a few seeds behind. If you are new to chipotles in adobo I list some tips for working with them in this article. Add the tomatillos, 2 garlic cloves, and a single chipotle to a blender. Pulse blend and taste for heat level. Half of you out there will think it’s hot enough already, and the other half will want more heat. If so, add the second chipotle (I usually do). And depending on the tomatillos, you might need a couple tablespoons of water to get it to your desired consistency, but I usually leave it kinda chunky. The final step is to hide the ingredient list and prepare to take all the credit for this simple, unique salsa. So good! 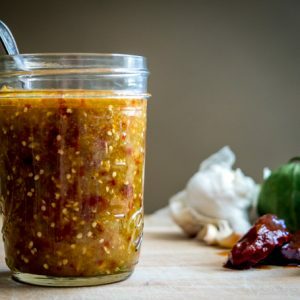 Any time you see Salsa Verde called for consider giving this Tomatillo Chipotle Salsa a chance — it wants to be part of your expanding repertoire. If you catch yourself trying to figure out how so much flavor can come from so few ingredients, it’s best to just take another bite. 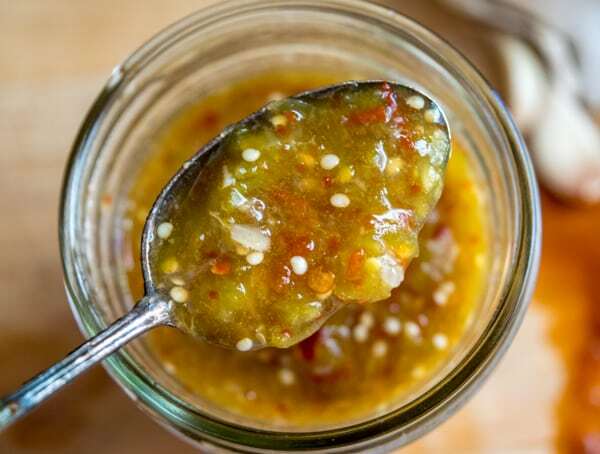 A rich Tomatillo Chipotle Salsa that's bursting with flavor. No one will believe you when you show them the tiny ingredient list. So good! Husk and rinse the tomatillos, cutting out the stems. 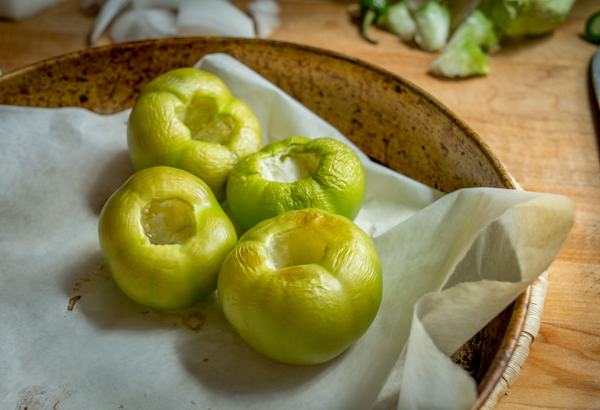 Roast the tomatillos in the oven at 400F for 10-20 minutes or until they start to turn army green in color and wrinkle up. De-stem and de-seed two chipotles in adobo. Add the roasted tomatillos, 2 peeled garlic cloves, and a single chipotle to a blender and pulse blend. Take a taste for heat level. If you want more heat add more chipotle. 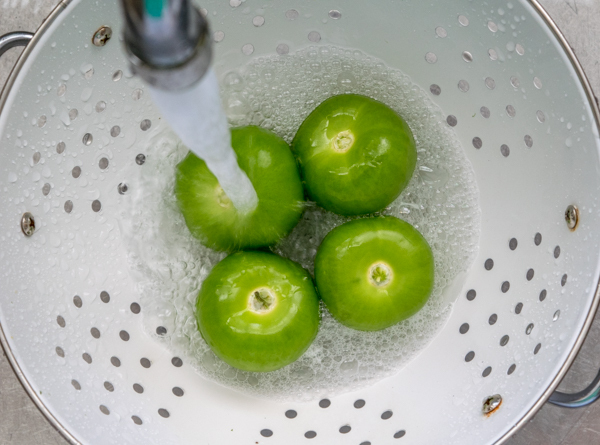 If you want a thinner salsa you can add 2-3 Tablespoons of water. Serve immediately and store leftovers in an airtight container in the fridge. You can get by using canned tomatillos but you'll definitely get an upgrade if you use fresh tomatillos. I rarely add salt to this salsa but you can add a pinch at the end if you want. I’ve also made this salsa using these homemade chipotles in adobo and it was divine! Thanks Gerardo! I will send you a copy of the Mexican Cooking Survival Guide. Cheers! This is sooo good! I mixed it with cream cheese and used as a spread on crackers. Delicious! Hubby couln’t stop eating it!! Yowsa never considered that before Erica but sounds kinda awesome — might have to try that! Glad it was a hit! This is amazing. Less effort than chopping up a quick batch of pico. Taste is insanely good. 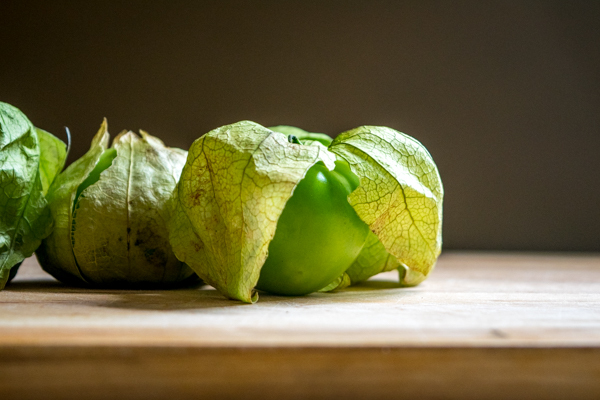 Since tomatillos keep for so long just sitting on the counter, it qualifies as a ‘pantry’ recipe. Thanks Patrick! Too easy. I feel like I’m cheating. I think the tomatillos tame the chipotles. Thanks David! Heh I remember thinking the same thing, it’s almost like magic the way you can create a new flavor with so few ingredients. So glad you found a keeper recipe! Hola James, thanks for your note! 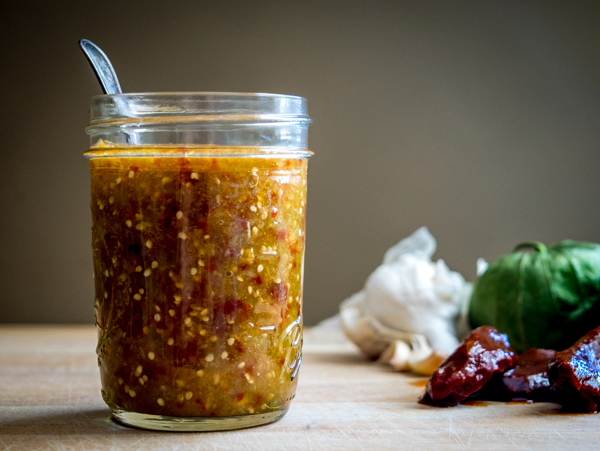 This Tomatillo Chipotle Salsa is one of my favorites so I hope you enjoy it. 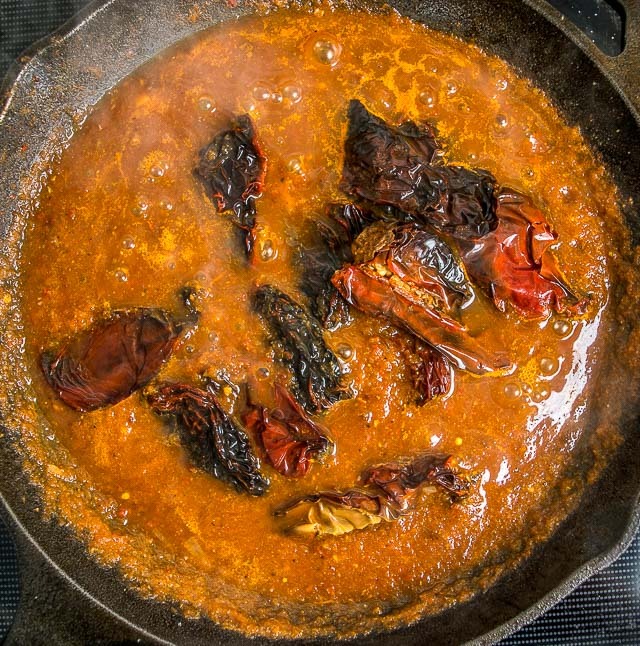 It’s true, charring the veggies and grinding them in a molcajete might give you a slight upgrade in flavor, but I think roasting them in the oven and using a blender gives you 90-95pct of the flavor potential, and given its ease and efficiency I tend to do it that way. By the way, you can usually get that IMUSA molcajete I used in the Guacamole post on Amazon for around 15 bucks. It looks like they are out of stock right now but keep an eye out for it, it’s a good investment. Cheers. Have you ever preserved this in sealed jars to eat throughout the year? Hi Jennifer! Sorry I can’t give a trip report on that one but I don’t do any long term canning myself. Cheers. This looks really great and will compliment my street tacos! Thank you. Found your site a few days ago, and made this salsa last night. What a flavor bomb! It was fantastic on ground beef tacos and our fried eggs this morning. Am not searching around for other items to slather this delicious sauce on! Thanks Biki, yeah flavorbomb describes it well! I use it all the time and lately in Vegetarian Chilaquiles and Breakfast Burritos. Keep in mind that you can always add 1/2 onion to it to create a slightly less concentrated version. This salsa is super simple, quick & easy to make, and delicious. Although I added no sugar, mine had a sweet note that was surprising. Could that be from the adobo sauce in the canned chipotles? There’s plenty of flavor with a satisfying kick and the color is beautiful. Thanks for this great salsa recipe.